The bishops of Illinois today released a statement on National Migration Week, set to begin Jan. 8. It follows, and is also attached. These words of hope from the Prophet Isaiah speak to a people who have long faced struggles and who seek hope in darkness. We, the Catholic Bishops of Illinois, on the cusp of a New Year, seek to offer that same voice of hope to another people in struggle: immigrant families. The fact that there are 11 million men, women and children in our nation who live in the shadows and are fearful of family separation by deportation is proof that our current system is flawed and our immigration policies have failed us. Let us pray that in this New Year we may recognize the need for comprehensive immigration reform that respects the rule of law, yet also ensures that the law is applied fairly and compassionately to those immigrant families among us who need our help. How appropriate it is that we celebrate National Migration Week (January 8-14) beginning with the Feast of the Epiphany of Our Lord and Savior Jesus Christ! Like the journey of the Magi following the star to the Source of hope, love and freedom found in the Holy Child lying in the Bethlehem manger, many families are also on a journey seeking hope in a new country. They seek a place of economic, emotional, physical and spiritual security, longing for those things needed to live in human dignity: productive work and fair wages, food, shelter, education, health care, and protection from harm, all too often out of reach in their native land. Yet, under the current immigration system in our country, we see the tragic separation of many of these families. Their hopes turn to despair. But it need not remain this way; we should seek to accompany these families on their journey and support them in their hopes. We should do this because their hopes for themselves and their families are also ours. Over the months to come, each Catholic diocese in Illinois will be sharing stories of immigrant families who are members of our parishes and communities. They will share their experiences of past and current struggles as well as their successes and hopes for the future. These stories will be shared in diocesan publications, in parish bulletins and on the Catholic Conference of Illinois’ website (www.catholicconferenceofillinois.org), as well as other sources. Please take the time to read their stories and learn about the immigration issues that significantly affect your neighbors and fellow parishioners. We call on all Catholics and people of faith in Illinois to pray for these families and to become those epiphanies: previously hidden manifestations of the Christ within, now revealing to others the deep compassion of Christ through our individual and collective efforts to provide hope and support to immigrant families and to advocate for comprehensive reform of our nation’s immigration laws. Kentucky: Who Speaks for Creation? We are pleased to be publishing columns again from three very different Kentucky writers. As there is time we will add more articles from these sources. The last weeks of session in the Pennsylvania Legislature saw much activity on the issues of concern to Pennsylvania’s Catholics. We offer our sincere thanks for your efforts this year, and we offer an update below. The staff of the PCC wishes you and your family a very Merry Christmas. May the joy and peace that the Christ child brings be with you throughout 2012! In the final days of their 2011 session, the Pennsylvania House of Representatives did not take up the issue of vouchers to the great disappointment of school choice proponents across the state. Senate Bill 1, The Opportunity Scholarship Act, passed the Senate in late October by a vote of 27-22. School choice supporters were hopeful that families in Pennsylvania would soon be able to choose the education that is best for their children, but the voucher proposal discussed by House leadership was vastly different than Senate Bill 1. Ultimately, this different language was never put before the House for a vote. Legislation concerning charter schools that included an increase to EITC was put forth for a vote and did not pass. Senate Bill 1 remains an active piece of legislation. Send a message to your legislature asking them to take up school choice when they return by clicking here. Championed by Rep. Matt Baker (R-Tioga), Senate Bill 732 passed the Pennsylvania House of Representatives by a vote of 151-44 on Tuesday, December 13. It passed the Senate earlier this year by a vote of 38-12 and on Wednesday, December 14, it was again passed in the Senate (32-18) in concurrence with the House. The bill awaits the governor’s signature. The new law addresses concerns that stemmed from a tragedy that occurred in the Philadelphia abortion clinic of Dr. Kermit Gosnell where a woman died and seven newborn babies were killed by infanticide. Conditions in the clinic were so filthy and unsafe that investigators called it a “house of horrors.” The measure holds abortion facilities to the same fire and safety standards, personnel and equipment requirements, and quality assurance procedures as other freestanding ambulatory surgical facilities. The passage of this bill into law is a victory for women and children in Pennsylvania. The Pennsylvania Catholic Conference (PCC) is urging all advocates to thank their legislators who voted yes for their pro-life vote on SB 732. Click here for the list of Senators and Representatives who voted in favor of the abortion clinic regulations bill. If you live in one of these legislators’ districts, you can use the Pennsylvania Catholic Advocacy Network to send an easy email thank you message today. On Monday, December 12, the Pennsylvania House of Representatives voted 146 to 45 to remove abortion funding from the state health care exchanges that will be created by the Patient Protection and Affordable Care Act (PPACA). This margin of victory in the state house indicates that the legislature is not in favor of using taxpayer’s money to fund abortions. According to a 2010 Quinnipiac Poll, 67% of Americans oppose abortion funding in the federal health care exchange. House Bill 1977 now goes to the state senate. This bill is similar to Senate Bill 3, which passed 37-12 in the Senate earlier this year, and has been sent to the house. Please send a message to your legislators requesting a pro-life vote! In addition to the legislation mentioned above, the PCC is also supporting a bill requiring that a woman be given the option to see her ultrasound and see/hear her unborn child’s heartbeat. This bill, HB 1077, was introduced in October with over 110 co-sponsors. The PCC hopes that this legislation will be considered early in 2012. The Texas Catholic Conference thanks you for your prayers your voice on behalf of the most poor and vulnerable. You have helped bring the peace on Earth that we pray for during this Advent season. We look forward to advocating with you for life, justice, and peace in the years to come, and we wish you a blessed Advent season and a joyful Christmas. 33 Hispanic Bishops, including several Texas Bishops, issued a letter on the Feast Day of Our Lady of Guadalupe, December 12, expressing their prayers for migrants in our nation and in the world. The bishops thanked the migrant community for their contributions to the welfare of our nation and assured migrants that they will continue to advocate for comprehensive immigration reform. You can watch a news clip on the letter featuring Bishop Flores here. Thirteen prisoners executed by the state of Texas in 2011 are the fewest since 1996—and well below the record of 40 executions set in 2000—according to a new report from the Texas Coalition to Abolish the Death Penalty. The TCADP report corresponds to national trends indicating that fewer death penalty sentences are being handed out nationwide. Dioceses throughout the state of Texas hosted grand celebrations in early December as a way of honoring Our Lady of Guadalupe during her December 12 feast day. In many ways, these celebrations focus on the beauty of her role as Queen of Mexico and Patroness of the Americas. Prayers focused on much-needed peace in Mexico and family reunification of immigrants on both sides of the border. Bishop Oscar Cantu of the Archdiocese of San Antonio, as well as San Antonio pastor Fr. Larry Christian, recently participated in a Religious Leaders Dialogue on the Death Penalty, held at Trinity University in San Antonio this past October. Bishop Cantu encouraged listeners to take the abolition message to the public square, while Fr. Christian shared insights on how Church teaching on the death penalty has impacted him throughout his life. You can listen to their remarks on the TCC podcast. You can encourage your friends and family to advocate against the death penalty in Texas by recommending that they subscribe to the Texas Catholic Voice, simply direct them to the Voice sign-up page here. It’s hard to believe that a nation founded two centuries ago upon principles of religious freedom and tolerance must fight to retain those principles today. Nevertheless, here we are, as a country, confronting those who seek to stifle religious values and practice from public life. For some time, we have witnessed a steady erosion of religious liberty in the face of a growing cultural and political secularism. As a Church, we live our faith through works of education, health care, and charity for the poor and disadvantaged. Increasingly, however, we find ourselves having to fend off those who want to impose demands or restrictions that go against our fundamental beliefs. Health and Human Services (HHS) acted to protect kids Dec. 7 when HHS Secretary Kathleen Sebelius rejected a recommendation of the Food and Drug Administration (FDA) to let stores sell powerful hormonal drugs to children over the counter. Thirteen prisoners executed by the state of Texas in 2011 are the fewest since 1996—and well below the record of 40 executions set in 2000—according to a new report from the Texas Coalition to Abolish the Death Penalty. The TCADP report corresponds to national trends indicating that fewer death penalty sentences are being handed out nationwide—falling below 100 (to 78) for the first time since the Supreme Court reinstated the death penalty in 1976. TCADP Executive Director Kristin Houlé attributed the drop to five death row inmates receiving stays of execution this year and an undeniable decrease of death sentences handed down by Texas juries since 2003. Only eight death sentences were issued this year. Analysts speculate that public concerns about the racial fairness, costs, and growing numbers of life-without-parole sentences have all played a role in a steep decline in the number of executions and death penalty sentences in the United States. For Texas, in particular, the high-profile cases of Hank Skinner and of Cameron Todd Willingham have led some to raise serious questions about the fairness and accountability of the judicial process for death penalty cases. Jeffery R. Patterson, executive director of the Texas Catholic Conference, said that the TCADP Report, Texas Death Penalty Developments in 2011: The Year in Review, was welcome news. Senate Bill 1 remains an active piece of legislation. One part of Senate Bill 1 is the Opportunity Scholarship, or voucher, program; another important part is an increase the long standing and successful Educational Improvement Tax Credit (EITC) program. Recognized as a national model and the best example of public-private partnership in Pennsylvania, the EITC program has allowed more than 40,000 students to attend the school of their choice in this school year alone. Hundreds of public school initiatives would have gone unfunded without this program. Send a message of support for school choice to your legislator using the Catholic Advocacy Network atwww.pacatholic.org. Shea is Outreach Director of the Pennsylvania Catholic Conference – the public affairs arm of Pennsylvania’s Catholic bishops and the Catholic dioceses of Pennsylvania. Senate Bill 732 passed the Pennsylvania House of Representatives yesterday by a vote of 151-44. It passed the Senate earlier this year by a vote of 38-12. The measure will hold abortion facilities to the same fire and safety standards, personnel and equipment requirements, and quality assurance procedures as other freestanding ambulatory surgical facilities. The bill now moves to the Senate for a concurrence vote. Yesterday evening the Pennsylvania House of Representatives voted 146 to 45 to remove abortion funding from the state health care exchanges that will be created by the Patient Protection and Affordable Care Act (PPACA). House Bill 1977 now goes to the state senate. Please send a message to your Senator requesting a pro-life vote! According to Harrisburg insiders, the governor and high level legislative leaders confirmed that they are working on an education reform package, including vouchers and an EITC increase, which they believe can get to the governor’s desk before Christmas. One reporter confirmed this in his interviews with the governor and a spokesperson for House leadership yesterday. If you cannot meet with your legislator directly, meet with his or her staff or simply register your support for school choice with the receptionist. Organize visits to state legislators’ district offices with your friends, family, neighbors, or fellow members of your school or parish community. Pick up the phone and call. You can also use the PA Catholic Advocacy Network to look up the district office telephone number. 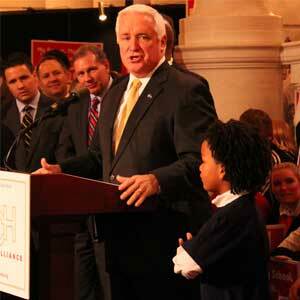 Governor Corbett is on our side; we should show him our support too! Call him at 717-787-2500 and you can use the PA Catholic Advocacy Network to send email messages to both your State Representative and the governor. Even if you have done it before, send another email. This time include the governor and forward this alert to your friends and neighbors. The school choice debate has been a long and exhausting effort, but we have made it this far because of your hard work. Let’s see this through to the finish line. A new law that includes opportunity scholarships and an increase to the EITC will be a welcome Christmas gift to Pennsylvania’s children! If finalized, this deal would mean a savings of $8 million a year for religious and independent schools in the MTA service area, and would end a disparity with public schools, which are currently reimbursed by the state for the payroll tax. As Gannett reported earlier and confirmed independently this afternoon the tax will be reduced for small businesses and parochial and private schools will be exempted. The latter is a win for Archibishop Timothy Dolan, who had pushed for the exemption. The Catholic Conference will be supporting HB 70 again this session to allow former felons to vote and participate in our public life. Senate Bill 1 includes two kinds of scholarships that will allow students to attend a school of their choice – Opportunity Scholarships, or vouchers, and Educational Improvement Tax Credit (EITC) scholarships. Throughout the debate, many have expressed their support for the EITC, but some remain unsure about Opportunity Scholarships. But really, Opportunity Scholarships are the clear next step in education reform that gives students the opportunity to go to the school that best helps them to realize their potential. Recognized as a national model, Pennsylvania’s Educational Improvement Tax Credit (EITC) program has allowed more than 40,000 students to attend the school of their choice in this school year alone, and hundreds of public school initiatives would have gone unfunded without this program. Since the program’s inception in 2001, over 250,000 students have benefited from the EITC. Additionally, the business community has contributed over $460 million to ensure that Pennsylvania’s children receive the education they deserve. Students in every legislative district benefit from the scholarships that are funded by the state tax credit program. The Opportunity Scholarships program will build upon this success by allowing more students to reach their potential by opening educational avenues that were never open to them in the past. The Opportunity Scholarship program is a for a full tuition voucher while the EITC program is a tuition assistance program that covers a portion of the full tuition. Therefore, many of the families that will benefit from Opportunity Scholarships could not consider paying nonpublic school tuition rates, so they wouldn’t have applied for EITC benefits. By all counts, EITC is a huge success and it enjoys wide political support. But a decade ago, skeptics had the same doubts about EITC that they do now about Opportunity Scholarships. In 2001, they said EITC and school choice would reduce state revenue and take money away from cash-strapped public schools. They are launching the same objections to vouchers. But since 2001, state spending for public schools has increased dramatically – state subsidies increased more than 30% and local construction and debt spending have doubled. (Source: Commonwealth Foundation). The proposed opportunity scholarship program as proposed will cost just 28¢ for every $100 spent by the state on public education. EITC opponents said there was no accountability for the scholarship dollars, no way to prove that EITC would benefit students. Thousands of EITC scholarship recipients attend Catholic schools that rightly boast graduation rates at or near 100% for non-transferring students. Of those high school graduates, over 90% go on to attend either a two or four-year institute of higher learning. Further, there is no test for an improved attitude, respect, good manners or depth of spiritual awareness; no measure for a child’s feeling of security. There is no test to determine which students would have dropped out if EITC had not given them a chance for success. Opportunity Scholarships will give the lowest income students in the worst performing schools a chance to go to a school with a successful track record. And EITC opponents said, “It was anybody’s guess whether the program will expand or become yesterday’s news.” In 2001, EITC was funded with just $25 million. In 2011-2012, $75 million was budgeted with a sizable waiting list of companies ready to invest millions more. And there is a waiting list a mile long of students eager to get EITC scholarships so they can go to a different school. We know that EITC is one of Pennsylvania’s greatest success stories, but there is still work to be done. It is time to help even more children receive the education that is best for them. EITC has already helped thousands of students achieve and excel because their parents were able to choose the best school for their children. The Opportunity Scholarship program is a small but targeted program that will give a fighting chance for a better future to children who need it the most. School choice that includes Opportunity Scholarships and expands the successful EITC is the right choice for Pennsylvania’s future. 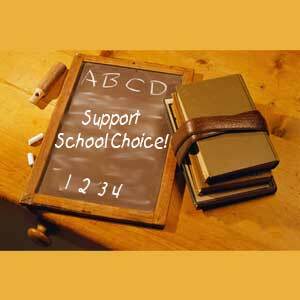 Click here to send a message to your state legislator in support of school choice. Texas: A Shopping We Will Go . . . Advent has arrived and brought with it the extreme shopping that our culture associates with Christmas preparation. As much as we try to resist the temptation, the draw of mall is enticing. The other day I told my husband I needed to run out to get a few things at the store and my two-year-old immediately grabbed her play purse and ran to the door giggling and shouting, “I’m going shopping!” Granted, I was running to HEB for eggs and milk, which she enjoys because she faces Mommy in the shopping cart and we talk, but it still made me reflect on what messages we’re sending our little ones about shopping. The next day while reading The North Texas Catholic, I came across a dapper picture of Bishop Vann modeling a WORN scarf from Catholic Charities of Fort Worth (CCFW). I felt that tug of the Holy Spirit reminding me of a better shopping message for my daughter. WORN is a socially-conscious business venture of CCFW. The mission of WORN is to provide refugee women living in the United States with an opportunity to utilize the traditional skill of knitting to increase their families’ household income, thus empowering them to rise above poverty.